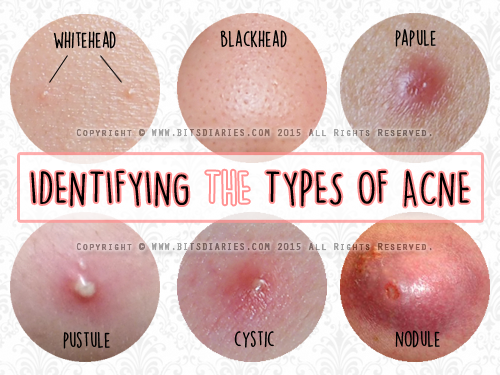 The most common types of acne are whitehead, blackhead, papule, pustule and cyst. Nodule is less common; it is similar to a cyst, but is more painful and larger in size. I will explain more on nodule later. Let's start from whitehead. Whitehead appears as a flesh-colored, white tiny bump on the surface of the skin. It is simply a clogged pore form underneath the skin and is usually not red or sore (not inflamed). Good news is it's mild and easy to treat! Exfoliation can help to treat and keep it at bay. A blackhead is similar to a whitehead, but the top is exposed to the air which causes the sebum to oxidize and changes from white to black. Treat and prevent it by exfoliating with an exfoliator. You can have it professionally extracted as well. A papule appears as a small, red-pink inflamed bump on the skin with no "head" and can be tender to the touch. It occurs when a closed comedone (whitehead) is infected by bacteria, leading to inflammation. It can get irritated easily, so avoid squeezing it. Anyway, it will progress and grow into a pustule. A pustule is an inflamed, nasty bump appears as a red spot with a white or yellow centre filled with pus. It is generally painless and occurs when a mixture of oil, dead skin cells and bacteria rising to the surface. If you have to pop it, you have to make sure that you do it properly because if you do it in the wrong way, it may cause damage to your skin and may lead to permanent scarring. A cyst is similar to a nodule but they are NOT technically one and the same. A cyst is a red, painful, pus-filled lesion occurs under the skin and is usually triggered by hormones spikes. It can remain on the skin for weeks. The most severe types of acne and the toughest to treat. A nodule is a very painful, large, solid acne lesion that is lodge deep beneath the skin. The infection happens deeper beneath the skin's surface, so a topical spot treatment might not be useful as it only dry out the skin's top surface. As a result, it is hard to treat and may persist for weeks or even months. Most of the acne (mild to moderate-severe) can be treated with over-the-counter products that contain active acne ingredient such as salicylic acid, benzoyl peroxide or tea tree oil. By identifying and understanding the type of your acne, you can determine the most suitable treatments to deal with them. Read Understanding The Acne Fighters — Salicylic Acid .vs. Benzoyl Peroxide .vs. Tea Tree Oil to find out more on these acne ingredients and how they work on different types of acne. Also, check out my 5 Acne Spot Treatment Recommendations that I find work best to zap blemishes. However, if you are plagued by many inflamed cystic and/or nodular acne (severe), I strongly advise you to seek medical advice. 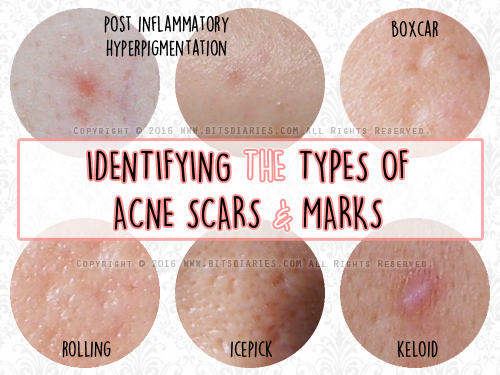 If you would like to know more about acne scars, check out Understanding The Types Of Acne Scars — Post Inflammatory Hyperpigmentation, Boxcar, Rolling, Ice-Pick, Keloid.